spring freezes without damage, despite the fact that it is among the earliest peonies to bloom. In fact, it's nearly always our first tall bush variety to open in May up here in Northwest Wisconsin. In these times of fickle weather, we seem to be getting more late spring freezes that can cause peony buds to fail to open--a condition commonly referred to as bud blast. But we've never seen this on Roselette, which seems to have anti-freeze coursing through the xylem in its stems. Bud blast can also be caused by other factors--most commonly by botrytis or grey mold--but here, too, Roselette seems to possess greater immunity than many other peonies. Some of this toughness may be related to its breeding. Roselette is a triple hybrid that came out of the work of one of the world's most renowned peony hybridizers, A. P. Saunders. 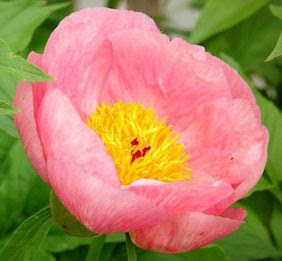 Its lineage includes the Albiflora, Mlokosewitschi and Tenufolia species peonies. But Roselette has much more going for it than hardiness. The soft salmon-pink cupped blooms atop 34 to 36-inch stems provide an elegant accent to the beautiful green green foliage, which remains attractive throughout the growing season. 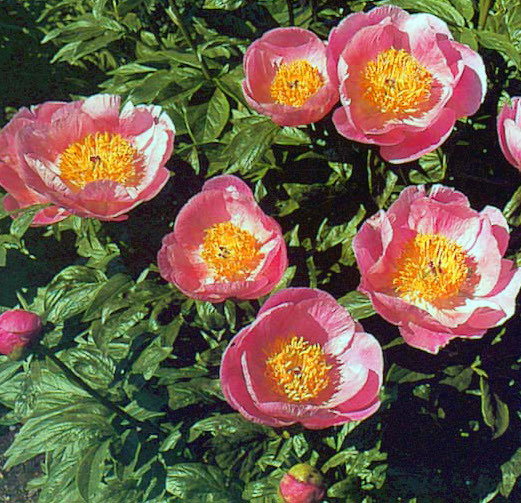 Combined with sturdy stems, these factors earned it a place among the varieties given the Award of Landscape Merit by the American Peony Society. Roselette has it all: hardiness, beautiful blooms and great garden presence.